With the departure of Gandalf Church at the helm of our Bears, Andrew Pratley takes over as the 18th head coach in our program's history. Pratley has 15 years experence as a head coach at the Class A and Class B school levels. Pratley was the head coach at West Branch Ogemaw Heights from 2004-2012 and Holland from 2013-2018. In those 15 years he and his teams made 10 appearances in the playoffs. While early problems slowed the progress of Portage Central's McCamley Field, things have accelerated in the last few months despite the adverse weather. The Home stands as well as the press box are in place. However, the stadium is still slated to open in October, well after the start of the 2019 regular season. Photos posted on Social Media confirm that the stadium is indeed "turned around" meaning that the home stands will no longer face the sun, but the visiting stands will. Portage Central is scheduled to play their first game of the season at home on August 29th. However, that may again be at Huskie Stadium on the campus of Portage Northern. The annual Portage Northern/Portage Central game is scheduled to be a Central home game this season, which may mean that Northern will be the road team at their own stadium. Some unexpected problems have thrown a proverbial wrench into the works of the new McCamley Field at Portage Central. Some issues have cropped up with the drainage at the new stadium which has delayed by nearly two months. Because of the issues, the stadium has had to have some design refinements and adjustments, which pushes back the completion of the new stadium until well after the 2019 season is supposed to begin, which makes the likelyhood that Portage Central will play another season at Portage Northern's new Huskie Stadium. The expected opening for the new McCamley is now pushed back to mid October at the earliest. We recently learned that former Portage Central head coach Bob Knight, was hospitalized and required surgery. Knight and former St. Joe coach Ike Muhlenkamp created one of the best 20 year battles in the old Big 8 when the conference title regularly went through St. Joe or Portage Central. Knight was on hand for the final game at the old McCamley Field last year when St. Joe closed out the Mustangs home field with a 14-7 win. Knight threw the switch to turn off the lights before a nearly 20 minute long fireworks show to close out the stadium. We wish him a speedy recovery. After waiting for over 50 years, Portage Northern's football team is just weeks away from playing their first real home game in school history. Huskie Stadium on the grounds of Northern High School is pretty much complete. The prefabricated pressbox was lifted into place during the week. Which makes the stadium ready to go for the opener on August 24th against Kalamazoo Loy Norrix. Their rival Portage Central will play their first "home game" at Northern's field the followin week against Kalamazoo Central. With the demolition of the old McCamley Field at Portage Central now complete, the Portage Central football team is obvioulsy playing each of their games at Portage Northern's new Huskie Stadium. However the Mustang football team is not the only fall sport forced to play at their rival's home field. The Portage Central soccer team has also had to give up their home games this season and play across town at Northern's Huskie Field, the soccer field that opened last year. The work at McCamley is taking place almost on top of where Central's soccer field is located and it cannot be used while the new football stadium is being built at Central. Portage Central's soccer schedule has been adjusted to accomodate the updated location information. One of the Central home matches has been made into a road game. The Mustangs game vs. St. Joe will now be played at the new Steve Upton Family Field at Dickinson Stadium on Tuesday, September 11th. Voters in Mattawan say "YES"
Voters in the Mattawan school district gave their approval to two bond proposals during the recent election. One was a renewal of the non-homestead property tax. The other issue was for a little more than $19-million for some repairs, renovatons, and technology upgrades for the district. One of those needs was for some of the athletic facilities. The district plans to build some new concession and restroom facilities near their baseball and softball fields, and the football stadium will also benefit with actual team rooms/locker rooms. Currently teams dress and meet in portable and temporary buildings near the elementary school. The bond will build new locker rooms at the football stadium. The bond does not include any actual work on the football stadium, or turf. A few years ago a bond for turf was defeated at the polls. Oh yeah... OUR FIELD IS DONE!!!! Last but not least, our brand new turf field is complete. Steve Upton Family Field at Dickinson Stadium is now all ours after nearly three months of construction. The new field will officially open on August 24th against Battle Creek Central. The synthetic turf field at Portage Northern's new Huskie Stadium appears to be complete, other than maybe a few minor things to check off the list, but the installation of the new scoreboard started earlier this week, and despite what we were told, Portage is not going with the Daktronics scoreboards like we were told earlier this year. The scoreboards are from a different company, but it will still feature a full color video display on the top half of the structure. A photo was posted on the PN football twitter page (https://twitter.com/PortageNorthern/status/996837261974130688). The MHSAA has named the successor to Jack Roberts. Mark Uyl will take over when Roberts' retires later this summer. Uyl has been with the MHSAA since 2004. He's a former teacher, coach, and administrator. He is currently the Assistant Director of the MHSAA right below Roberts. Uyl has also been a college baseball umpire and is said to be one of the best umpires at that level. More on Uyl from the MHSAA press release can be seen here. Now that the final event has been held at Dickinson, work on the new playing surface has begun. The first step will be to create a "bridge" over the track surface so that the trucks and heavy equipment don't damage it when the work begins. Benton Harbor assistant coach Jerry Diorio was named as the next head coach at Battle Creek Lakeview earlier this week. Diorio has been the top assistant coach for Benton Harbor under Elliot Uzelac the last three seasons. Diorio played for Uzelac while at the University of Michigan, Diorio was also the head coach at Wayland when St. Joe defeated the Wildcats in the 2008 playoffs. Diorio will be a social studies teacher at Lakeview Middle School. Lakeview was 4-5 last year. St. Joe faces Lakeview in Battle Creek in week 7. Progress has accelerated in the construction of Huskie Stadium at Portage Northern high school, now that the weather has started to cooperate. This week the installation of the artificial turf playing surface has begun. From the photos posted by the Portage Public Schools on their Facebook page, the endzones will be brown and the sidelines are orange. Huskie Stadium will make it's official debut on August 24th. BC Central looking for new A.D. It's been revealed that Battle Creek Central has an opening for a new Athletic Director. Michael VanHoven is stepping down after this school year. VanHoven is originally from California and was a wrestler at Cal State Fullerton. CSF's wrestling team was discontinued in 2010. VanHoven has had stops as a coach, including Flint Beecher High School. St. Joseph will open the 2018 season at home against Battle Creek Central. MHSAA Executive Director John "Jack" Roberts announced his retirement effective in August. Roberts has spent the last 32 years as Executive Director. When he steps down, he will be the second longest serving Executive Director in the 94 year history of the MHSAA, and only the 4th person to serve in that role. When asked about his greatest accomplishments during his time. he said that the efforts to increase safety of the student athletes, allowing for cooperative teams. and the programs to increase sportsmanship. The MHSAA did not announce a timeline to name his successor. Our last update for now is the update on the work on the turf at Dickinson Stadium. While we can't reveal any details about it. The final designs are close to being approved and renderings of the new playing surface are expected roughly the same time. Dickinson's last event before the installation of the turf starts will be the 2018 SMAC Track and Field meet on May 12. The work on the new surface is expected to begin on the following Monday. When we get anything, we will post it here. Kalamazoo Central has found their next head coach, and it's in the form of a Ferris State alum with stops in Denver, Green Bay, New Orleans and San Diegon in the NFL. Carlton Brewster takes over the Maroon Giants program. Brewster played his high school football at Grand Rapids Creston, falling in the 1999 state championship game. While at Ferris State, he amassed over 3,100 yards recieving and 25 touchdowns. He does have head coaching experience, with stops at Wyoming Lee and Wyoming Godwin Heights. More information fromm Mlive and Fox 17. It's been a few months since we've seen any photos and videos of the new football stadium at Portage Northern, until today. A tweet appeared from a Portage area drone photographer, who has taken many videos of the new faciltiy posted a few aeriel shots of the new stadium. The photographer posted the photos on his twitter page, (and can be viewed here. We can clearly see the home stands nearly complete with the exception of a press box, the visiting stands are just starting to be installed. We can also see one of the track and field sites in the north end of the stadium, as well as the two field goal posts. The outbuildings look like they are nearly completed, which could either be a concession stand or restroom facility. We do see a ticket booth. The stadium will be used by Northern and Central this season before the new stadium at Central opens in 2019. The Michigan High School Athletic Association has released the enrollment figures for the upcoming 2018-19 school year. For the 10 of the 11 SMAC schools there will be no change in classes, the 1 that will change is Lakeshore, who drop from Class A to Class B. The school with the largest decrease in the conference is Battle Creek Central, who lost 185 students from last year. Portage Northern lost 55, with St. Joe down 33 and Lakeview down 32. The greatest increase was 22 at Gull Lake and 17 at Niles. While in previous years, the MHSAA Classication of A, B, C, and D were used for Boys and Girls Basketball, and Girls Volleyball. Starting in the fall of 2018, each sport will be divided into equal divisions of schools that sponsor that sport. The Class A, B, C, and D will still be used in their current format in the MHSAA Football playoff formula. A win over a Class A team will earn a school 80 points, 64 for a win over a Class B team, 48 C, 32 D. The MHSAA Will release the individual sport breakdowns in a few weeks. Portage Northern football coach Pet Schermerhorn stepped down from one of his positions at Northern. He recently stepped down as coach of Northern's girls varsity basketball team. Northern went 0-21 this past season after a 10-11 season the year before. Schermerhorn spent the last three years at Northern's varsity girls coach. We are still awaiting any word on who the next head coaches will be for Battle Creek Lakeview and Kalamazoo Central. Matt Miller stepped down in early January, calling it quits after 30 years of coaching. While Dana Chambers tenure at Kalamazoo Central ended in November after the Maroon Giants season ended. While we have yet to see any updates recently on the construction of the new stadium at Portage Northern, we did learn that Northern, and eventually when it opens a year later, and Portage Central's new stadiums will include video scoreboards, similar to what we have at St. Joe, but with the exception of the ability to do live video. The live video feature isn't expected be used until each school plays at their own stadiums. Earlier we posted that most of the SMAC schools that had an open week on the schedule have filled those games. One was Battle Creek Lakeview, who had an opening in week 9, they'll play at their longtime former conference rival Battle Creek Harper Creek. We still don't have anything on Kalamazoo Central's week 3 game. Battle Creek Lakeview is the second SMAC school that will be in search of a new head football coach. We told you a few weeks ago that Dana Chambers has stepped down at Kalamazoo Central, now Battle Creek Lakeview Matt Miller is also stepping aside. Miller has been a coach in some capacity for 30 years, the last 20 at Lakeview and 9 of them as the Spartans Head Coach. Miller leaves with an 48-29 record. During his tenure Lakeview made 5 straight playoff appearances in 2012, 13, 14, 15, & 16. Miller told the Battle Creek Enquirer (link) he considered stepped down last year when his son graduated, but he stayed to make it an even 30 year career. After Benton Harbor's departure from the SMAC after the 2015 season, 9 of the 11 SMAC schools have to fill the "open" date in their schedule with Benton Harbor's depature. Here are the teams and their Open date games as we know right now. After 8 seasons, Dana Chambers has decided it's time for a new voice to direct the Kalamazoo Central football program. Chambers has resigned as the Maroon Giants head coach. In an article from the Kalamazoo Gazette, Chambers said. "I just think the program needs a different voice, and the kids need to hear a new voice. There's nothing personal; it's just time for me to move on from that position." Chambers had a record of 23-49 in his 8 seasons, having never made the playoffs. and only finishing with a winning record once (5-4 in 2016). Chambers plans on staying in his position as a disciplinarian at the high school. There has been no statement from Kalamazoo schools about Chambers resignation. The SMAC has released a new logo for this year. The New SMAC logo also includes color varients for each SMAC school. St. Joe, Portage Central, Niles, Mattawan, and Battle Creek Central also has a varient depending on their shade of maize and blue, blue and gold. The SMAC Logo's and their varients are on the SMAC page here. When Dickinson Stadium was designed, the original plans called for it to be built with artificial turf, after 15 years that turf will finally be installed. Thanks to a donation from Steve and Elizabeth Upton, Dickinson will be getting the artificial playing surface it was intended for. The donation will be reflected in the name for the new surface. It will be known at Steve Upton Family Field at Dickinson Stadium. The playing surface will be completed in time for the 2018 regular season practice. It also means soccer is moving back to the high school for the first time since the early 1990's. Dickinson will become the 6th SMAC school that will have synthetic turf. There are three SMAC schools will turf right now. Lakehsore, Gull Lake, and Battle Creek Central currently have turf. This summer Dickinson will be converted and Portage Northern's new stadium will open and in 2019 when Portage Central's new stadium will open it will mark more than half of the conference schools playing on turf. Portage schools have posted a new video and a few photos on their football facebook page about the progress being done at the new Portage Northern Huskie Stadium, in the drone video (starting at the 1:38 mark) you can see the 4 light pilars already in place, as well as the some of the support columns for the home stands, the outline of the track, the supports for the scoreboard. As well as ticket booths, restrooms, and concession buildings. I guess we impressed them. 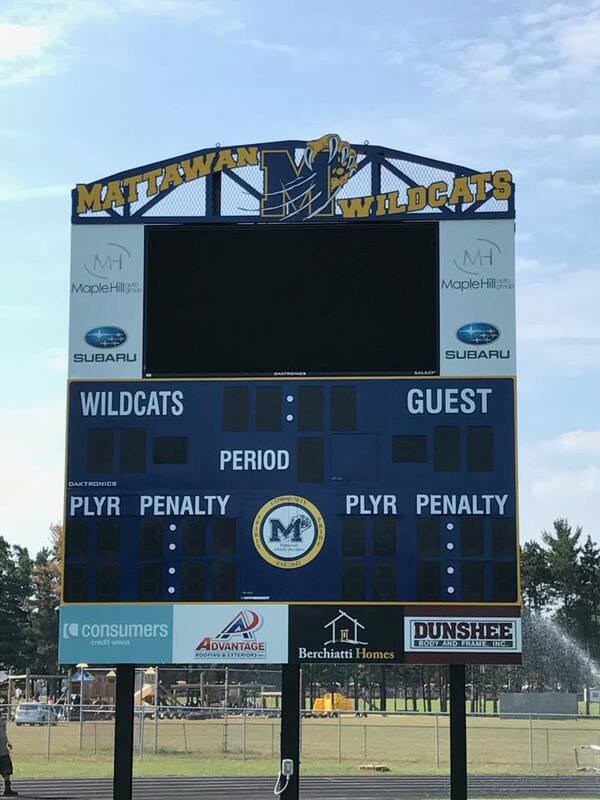 Mattawan's Athletic Booster Club has stepped up and purchased a new scoreboard for the Mattawan football stadium. The picture shown on facebook shows the new board which also includes a message board. The photo also shows that the scoreboard is actually a field hockey scoreboard which can be converted for use in football with the addition of metal name plates that slide into place, like our old scoreboard did for track and field season. Like ours, the board is by Daktronics Inc., Daktronics is probably the world leader in scoreboards and video, message displays. Daktronics is responsible for the football scoreboards not only at St. Joe, but Lakeshore, Niles, Kalamazoo Central, Loy Norrix, Battle Creek Central, and Battle Creek Lakeview. Recently Daktronics installations include Ford Field, Little Caesars Arena in Detroit, Mercedes Benz Stadium in Atlanta. A job posting on the Mattawan schools website indicates there is an opening for the Director of Student Activies/Athletics position at Mattawan. There is no word on why existing Athletic Director Ken Mohney is not returning for the upcoming school year. In a recent video taken from a drone flyover of the new facilities at Portage, show that quick progress on the new Northern soccer stadium as well as the ground work and site prep work progressing at the new Huskie Stadium for football. In the video (https://www.wevideo.com/view/943463129) the drone flyover shows the work at the new pool at Central, the new soccer field and football stadium at Northern. TV 46 WHME, who has done several of the St. Joe/Lakeshore games in the past few years, will venture into Michigan again next season, The South Bend TV station will broadcast the Niles/Fairfield game on September 8th. While the games are televised, they are not broadcast live. The game will air at 11 PM that Friday night and again at 9 AM the next morning. The games also can be purchased on DVD. Official groundbreaking ceremony at Portage Northern, stadiums names revealed. While the most high profile and notable project is still over a year away from completion, the Portage Public Schools held an official groundbreaking ceremony this week. Construction has already begun on several of the new athletic facilities, including a new multi use field for soccer/lacrosse, a practice field and the tentatively named "Huskie Stadium." The new football stadium is still scheduled to be opened for the 2018-19 season. The new "Huskies Stadium" will be hosting both Portage Northern and Portage Central's football games for the 2018 season. The two schools have been sharing McCamley Field at Portage Central since 1964, when Northern opened. McCamley Field opened in 1952. The Huskie Stadium name apparently has been voted on by a committee of students and administration. Another finalist for Northern's field was The Tundra at Portage Northern. As for Portage Central, students and administrators have decided that they would prefer the McCamley Field name remain for the new stadium at Central. McCamley is named after Stuart McCamley who was a founder in the Portage area, but also donated the land where the stadium currently stands. In the same way that St. Joe kept the Dickinson Stadium name when the new field was opened in 2003. The high school currenlty sits on the land what used to be part of the Dickinson Estate which was donated to the St. Joe schools. The names are only recommendations by the students of each school. The Portage Board of Eduction will vote on making those names official at their next meeting on May 22. Both schools are holding a commemorative brick sale for both facilities. They can be found at www.pnbricksale.com�or�www.pcbricksale.com. The schoold held a name the stadium survey and found there was little support for any corporate or professional style naming rights deals. The schools also found out that the bids for the stadiums have come in almost $3 million under what they had projected. The reseeding process at Dickinson stadium was pushed back from it's originally scheduled date in April. Because of the heavy rains in the area in April and in early May, it was decided to hold off on the new surface. The field has been regraded and leveled and has finally been seeded. A few track and field meets also pushed the reseeding process back a few weeks. Even with the delay, the field is still expected to be ready to play well in advance of the Bears preseason activities at Dickinson Stadium. The SMAC will have a slightly different alignment for the start of the 2018-19 school year. Mattawan, will be leaving the Eastern Division and moving back to the Western Division. Mattawan will be one of three SMAC teams that have at one time been in three different SMAC/Big 16 Divisions (East, West, and Central). Mattawan joined the league in 2001 and were placed in the Central Division, where they stayed until 2007-08 when they went to the West Division. Mattawan was placed in the West Division in 2007 after Dowagiac's departure. Mattawan stayed in the West after another realignment in 2009 and again in 2011 when Gull Lake joined, replacing Lumen Christi. When 4 schools in the East left Mattawan was placed in the East Division in 2014, where they've been since. Over the spring, work has continued at Dickinson Stadium to replace the playing surface, the next phase of the project will start next week when the site will be made level and the reseeding process will begin. The grass from last year became unplayable and potentially dangerous if things were not corrected. The decision was made to remove the old grass and dig down and take up several inches of the soil so the entire field could be replaced. This summer, the stadium will also be undergoing some repair work. The railings around the stadium have slowly started to become lose from the concrete bases and then causing the concrete to fracture and fall out and making the rails unstable and exposed. Work to repair and replace some of those railings will be completed over the summer in addition to the replacement of the running track. Gull Lake has been searching for a new football coach since Tim Van Wormer stepped down after three seasons as head coach. Van Wormer stepped down after going 8-19 in his three seasons. Taking over the Gull Lake football program is 36 year old Battle Creek native Ryan Gallogly has been named as head coach. Gallogly is the fourth head coach since Mark Blaesser was hired in 2005. Blaesser coached until 2010 going 34-23. Former Western Michigan Quarterback Tim Hiller coached from 2011 to 2013 going 8-19, the same record as his replacement Van Wormer. According to the Battle Creek Enquirer, Gallogly is a graduate of Western Michigan University and is a native of the Kalamazoo and Battle Creek area. Gallogly was a head coach at the age of 22 for Lafayette Catholic Central in Indiana. Six years as a head coach at Brebeuf Prep, also in Indiana with a 47-20 record. He also spent one season as head coach at East Kentwood in 2003, with a 5-4 record with the Falcons. Gull Lake will play at St. Joseph in week 8. Ground work has begun on the site for the new football stadium at Portage Northern High School. While the site is still unable to be seen, it's been said that the stadium will actually be below ground level, similar to the stadium at Kalamazoo Central and Otsego. The stadium still has no official name as of yet, although the Portage School District held a name the stadium contest in January. Field and track will be replaced at Dickinson. After the playing surface at Dickinson Stadium was infested and destroyed by grubs and other pests. Work is underway to redo the field for next season. The existing grass was killed off and is currently being removed, along with close to a foot of dirt from the field. After that is removed, new dirt will be placed and the field will be reseeded and allowed to grow over the spring and summer to be ready for next season. In fact only two events will be held at Dickinson Stadium during the spring, St. Joe was set to host the 2017 Rotary Track Meet, but because of the work, that was moved to Benton Harbor for a second straight year and only two regular track meets will be at St. Joe. In addition, graduation will not be held at Dickinson Stadium, it will be at Shadowland Pavillion on Silver Beach. It was held there in 2002 and 2003 when the current stadium was under construction. Then during the summer, the track surface will also be replaced. The track has been in place since the stadium was constructed in 2003. The first artist concepts of the new football venue to be built in Portage have been released by the Portage Board of Education. Northern's new stadium will be located on the northwest corner of the Northern High School property with the north end of the field along I-94 before the Westnedge exit. The new stadium will have an artificial turf playing surface. The stadium does not have an official name. We've learned that the Portage School Board reserves the right to name the facilty as they see fit, possibly opening up the possibility of a naming right's option. However, there is the chance that construction of the new stadium at Northern will not begin in the Spring of 2017 as previously announced. Concession/restoom building, located in the southwest corner of the stadium complex. Battle Creek Lakeview has been in the news recently, most notably with the school's new policy that forbids their students from having cell phones while in class. But the school has also named their new athletic director after the retirement of Greg Hermsen. 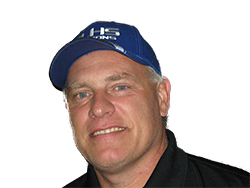 Hermsen was the AD at Lakeview since 1997. Zac Stevenson is the new AD, he's from Michigan and has spent time in Manistee and Detroit. He has been living in New Hampshire for 2 1/2 years. He's a graduate of Western Michigan University. He has also been a coach, coaching soccer and basketball. Former Kalamazoo Central and Western Michigan University great Greg Jennings has announced his retirement from the NFL. Jennings played in 10 NFL seasons, his first 7 with the Green Bay Packers, two with Minnesota, and one year with the Miami Dolphins. Jennings (32), helped lead the Giants to their second ever playoff appearance in 2000, when the Giants went 7-3 that season, including a 12-2 win at St. Joe in which Jennings returned a punt well over 90 yards for a score. Jennings caught 571 passes for 8,291 yards and 64 touchdowns. Amazingly Jennings never lost a single fumble in his 10 year career. He won a Super Bowl while with the Packers, (Super Bowl XLV on February 6, 2011). Starting with the 2016 season, schools and leagues can ask the MHSAA for permission to use a 40 second playclock instead of the normal 25. The 40 second option would have the clock resetting within 3 seconds after the previous play ends, The back judge will signal for the 40 second clock to start. There are more than a dozen exceptions where the clock will reset to 25 seconds, such as after a penalty, after timeouts, etc. The application is not a guarantee that the game will be granted approval to go to the 40 second option. It's similar to the MHSAA's policy last season for basketball where schools could apply to do a game in two halves instead of four quarters. St. Joseph and Kalamazoo Central will open the 2016 season three hours before everybody else will, but the first game of the SMAC season also will be taking place roughly 149 miles east of the originally scheduled location. Instead of the Bears and Giants opening up at Dickinson Stadium, the two teams will be meeting for the season opener at Michigan Stadium in Ann Arbor on the Campus of the University of Michigan. The game scheduled for August 26th will start at 4:00 PM. It's part of a 7 game "Battle at the Big House" series of games over a three day period. St. Joe and Kalamazoo Central are the third of the seven games. There are two games each on Thursday and Friday, and three games on Saturday. We've been eagerly awaiting any updates on what the new stadiums in Portage will look like, but the designs haven't been released to the public yet. However, we do know when those facilties will be worked on and when they will open. A post on the Portage Public Schools Bond update page says that the facility at Northern will be built first, However contstuction is not scheduled to begin until Spriing of 2017, and will continue through Summer of 2018 and will be open in time for the Huskies 2018 fall schedule. Central's stadium will begin construction in Spring of 2018 and will wrap up in Summer of 2019 with the Mustangs making their debut in the new PC stadium in the fall of 2019. Both schools will play thier 2018 schedule at the yet unnamed stadium located at Portage Northern High School. There is no word yet on any names on Northern's new stadium or if the stadium at Central will retain the McCamley Field moniker. There are no specifics on any designs, renderings of either stadium yet either. During the most recent elections, voters in the Lakeview school district were asked to pass two bond proposals. One would pay for new equipment and technology and remodel some buildings. The other would improve the athletic facilities at Lakeview, including the addition of turf at Lakeview's Spartan Memorial Stadium. The first one passed by a nearly 60%-40& split. However the athletic issue failed by 74 votes. It was reported that Battle Creek Lakeview's Athletic Director Greg Hermsen will retire. Hermsen helped guide Lakeview's transistion for the Twin Valley Conference to the SMAC in 2001. He's been at his current position since 1997 after a stint as an assistant football coach at Western Michigan University. Hermsen will stay on until the end of June. The Michigan High School Athletic Association has released the enrollment figures for the upcoming 2016-17 school year. For the 11 remaining SMAC schools there will be no change in classes. The school with the largest decrease is still the largest school in the conference Kalamazoo Central. Loy Norrix also lost 61 students but remains the second largest school in the conference. Portage Central gained 37 students and overtook crosstown rival Northern for 3rd. With the departure of Benton Harbor, Lakeshore is now the smallest and now the only Class B team in the conference at 865 students. Lakeshore lost 9 students for a total of 865. Shortly after the 2015 season ended, Niles coach Antwon Jones stepped down as the Vikings head coach. Less than a month later Jones was hired to be the head coach at South Bend Adams, which he serves as the Student Resource Officer. Jones played three seasons at the University of Notre Dame, under Coaches Lou Holtz and Bob Davie and went 13-23 in four seasons with the Vikings. Filling the vacancy at Niles will be Joseph Sassano Jr.. Sassano is originally from the South Bend area, where his father Joe Sr. was working as an event booker for the University of Notre Dame's Athletic and Convocation Center. Sassano, 54, was a an assistant at Penn High School for 12 years, coaching quarterbacks and running backs while at Penn. They won 4 state championships and were runner up twice. Most recently he was the head coach at LaSalle-Peru High School in Illinois from 2007-13, making the Illinois state playoffs three times. Sassano moved back to South Bend in 2014, where he works as a health insurance agent. Sassano is a 1980 graduate of South Bend St. Joseph's High School, and attended the University of Notre Dame for two years before transferring to Illinois State University. With the departure of Benton Harbor from the SMAC Conference, the remaining league teams are busy trying to do something that no SMAC team has had to do since 2000, fill a football schedule. Since the formation of the then Big 16 in the 2001 season, every game has been scheduled by the league, but now with only 11 teams, there are 9 schools that will have to fill that blank on their schedule where Benton Harbor would be. Recently the voters in the Portage Public School system were asked to approve a series of bond proposals, one of which would build new football stadiums not only at Portage Central, but Northern as well. Northern has played football at their rivals field since the school opened in 1965. In a few years, the tables will be turned for at least one season, maybe two, as the Huskies will have their own facility. While Northern enjoys playing football at home for the first time in their history, it will leave Central to be the road warriors while McCamley Field at Portage Central will be demolished and recontstructed at the existing site. Northern's new football facility will be located where the current baseball field is. While nothing specific about the design of each stadium have been released. The site plans released by the Portage Public Schools show that the new field at Central will be flipped so the home fans and pressbox will no longer be facing the sun. There is also no word on if the stadium at Central will retain the McCamley Field moniker. The timeline for contstruction has not been released but is expected by the first week of April. Major repairs are needed at McCamley Field and the stadium issues make it unlikely that the district can wait long to begin the work at the stadium at Northern. A recent conversation with Central High School coach Mick Enders revealed that Northern's stadium will begin contruction by this fall and will be complete by fall of 2017. Both schools will play their 2017 schedule at Northern's new stadium. An ironic twist to the situation is the Northern is scheduled to be the road team in the game against Central in 2017. Battle Creek Lakeview is holding a bond proposal for the May 2nd election. The 2nd of the two proposals would provide updates to the auditorium at Lakeview Middle School and would also allow the district to change the playing surface at Spartan Memorial Stadium from grass to syntheic turf as well as improvments to the track. The expected cost of the turf alone would cost approximately $1.3 million dollars. A poll done by the district voters show that 60% would vote no. Former St. Joe coach Elliot Uzelac's brief retirement is over as he accepted the position as head coach at Benton Harbor last week. Uzelac went 45-13 with St. Joe frorm 2006-2010. Uzelac signed a four year deal to help turn the Benton Harbor football program around, Uzelac is foregoing a salary for this season instead turning it over to his assistant coaches, including former Michigan Wolverine Jerry Diorio, and former St. Joe staffer Lyle Hayden, as well as former players Matt Mattox and Devonte' Jones. The Tigers will open the season at Gull Lake, where Uzelac won his first playoff game with St. Joe in 2006, when St. Joe won 14-0 in the first round of the playoffs. Uzelac will return to St. Joe as an opponent on October 2nd on the same night we commemerate the 100th season of St. Joe football. The 2015-2016 school year marks the final season of Benton Harbor in the Southwest Michigan Athletic Conference (SMAC). A week before the hiring of Uzelac, the Benton Harbor Board of Education voted unanimously to leave the conference. New Athletic Director Fred Smith did not indicate which, if any, conference the Tigers might join. The two most likely choices, would be either the Wolverine Conference or the two year old BCS Conference. Benton Harbor will play this last season in the league. The SMAC will be down to 11 teams after Benton Harbor leaves. Is Niles the next to go?? In an aritcle in the Niles Daily Star (Conference realignment on the horizon?, 7/27/15), author Scott Nowak reported that there are some that wish Niles would also exit the SMAC and join Benton Harbor and head to the Wolverine Conference. Citing a desire to resume the 100 year old rivalry football game with Dowagiac as the primary reason. New Stadium for Portage Central.... and Northern??? At a recent Board of Eduction meeting for the Portage Public Schools, the board was presented with some options about some work to be done in the school system. The superitendent presented 5 different options, mostly dealing with work to be done at the middle schools or creating new middle schools. In all five of the options the question of new stadiums for each of the Portage High Schools were raised. Portage Northern and Portage Central play football at Portage Central's aging McCamley field which has some structural issues that need to be addressed going forward. The board spent over $75,000 in repairs to McCamley in the 2014 school year, but an unconfirmed report says that the building inspector in Portage has threatened to close the stadium if repairs aren't done. These questions are what the board is considering to send to Portage voters for approval. In the options the stadium issue was separate from the school work in 4 of the 5 options. One of the following five Options will be sent to Portage Voters in the November elections. 1. A. Two New Middle Schools, work at West Middle, two pools, busses and technology and two new stadiums. 2. A. Two New Middle Schools, work at West Middle, two pools, busses and technology B. Two new stadiums. 3. A. Two New Middle Schools, work at West Middle, busses and technology B. two pools and two new stadiums. 5. A. Two New Middle Schools, repurpose West Middle, two pools, busses and technology B. two new stadiums. Marc Throop was fired in February after Gull Lake found some financial irregularities in the athletic department. An investigation by the Kalamazoo County Sherriff's department was conducted into Throop. The County Prosecutor decided there was not enough evidence that a crime was committed and charges will not be filed. Throop was set to retire at the end of the 2014-15 school year anyways. He's served at Gull Lake's Athletic Director for more than 20 years. The 2015-16 MHSAA Enrollemnt figures have been released and it shows only one school will be changing classes. Lakeshore's one year run in Class A is over and the Lancers will be back in the second tier of Michigan high schools in terms of student enrollment. Kalamazoo Central replaces Loy Norrix as the largest school in the SMAC with Benton Harbor the smallest. Portage Norther overtakes rival Portage Central in enrollment for the first time in history of the two schools. One of the oldest stadiums in the league is getting a facelift, but really a rebuild. The crumbling concrete stands and breaking benches at Griffith Stadium at Kalamazoo Loy Norrix are now gone, making way for some brand new bleachers and a new concession stand, restroom, and ticket booth building. Plus the new Norrix stadium comes with an updated and more fierce looking Knight logo for the school. Southern Bleacher Co. of Graham Texas, will do the work on the stadium, at a cost of $477,645. The new stands are expected to be completed in time for the start of the 2015 season. We've been all awaiting word about what was the "Big Surprise" at Benton Harbor in terms of their football program. Several reports and our own sources have revealed that former St. Joe coach Elliot Uzelac was going to become Benton Harbor's next head coach, but the move came with a few conditions, including a switch of leagues to the BCS Conference. However that move was put on hold after the school board voted to suspend the superintendent pending an internal investation that may be related to the coaching and conference choice. Mattawan coach resigns, Brown named coach. A civil rights complaint, a history of inappropriate and sexist comments proved too much for Mattawan head coach Matt Stephens to be able to overcome. Stephens stepped down as Mattawan's head coach after five seasons. Stephens compiled a 31-19 record with the Wildcats, leading them to three playoff appearances, a district title and a school record 10 win season. But some racist, sexist, and other inappropriate comments came to light during the 2014 season which prompted a civil right's complaint (LINK). Ryan Brown, who was Mattawan's defensive coordinator under Stephens has been named as the new head coach. This year marks a special milestone in the history of the St. Joseph football program. The 2015 season is the 100th season in St. Joe football history. Not the 100th year, The program is actually older, but because some seasons were not held in the 1910's and 20's because of world events, this year marks the 100th season in the Bears program history. We are looking for your help to celebrate the history of the program. We're looking for photos, articles, clippings, anything that marks the history of the football program. If you have anything you'd be willing to share with us, please contact the football boosters at boosters@stjoefootball.com. Plus during the game against Benton Harbor on October 2nd. We will be holding a special 100th season special. We hope to see you at the game and we hope you have some history to share with us!!! Kalamazoo Loy Norrix will be under the direction of a new coach for the first time in seven years. Sean Bergan stepped down back in December. No official reason was given but Norrix AD Andwe Laboe told the Kalamazoo Gazette that he was sad to see Bergan go. The Bergan name does have some history in the area. Sean's brother Bill served as coach at Berrien Springs and his father Paul was once the head coach at Benton Harbor. Bergan compliled a record of 14-49 in his seven years as coach. Taking over for Bergan will be current Parma Western Athletic Director (yes AD not coach) Jason Porter. Porter will finish the school year at Parma before coming over to Norrix. Porter is a native of Kalamazoo, he's a 1994 graduate of Kalamazoo Hackett. He's actually a resident of Vicksburg but has been communiting to Parma during his five years on staff. Porter was a softball coach at Comstock and Kalamazoo Central. He has three years of head football coaching experience at LaVille and Prairie Heights, both in Indiana. Benton Harbor has been without an official head coach since Darric Randolph had to step down prior to the 2014 season. Assistant Coaches Randy Jones and Mike Gillespie ran the Tigers program last year as Co-Interim Coaches. Benton Harbor finished 0-9 for a second straight season last year. However we've found out that a "surpise" may be in store for the Tiger football program. Athletic Director Willie Wilson says they have their man, but a few details still need to be worked out. One of which includes work on a weight room facilty for the Tigers. The "Big Reveal" is expected soon. An article in the Kalamazoo Gazette shows that Gull Lake Athletic Director Marc Throop was fired back in February for taking athletic department funds. Gull Lake made the decision after financial irregularities were discovered in the athletic department finances. Throop was let go after 20 years as Athletic Director and just three months short of his retirement. Documents show that Throop admitted to taking money from the gate cash box several times, including $200 from a basketball game on February 24th which he also admits to doing several times in the past. The school hired a auditor to review the finances and were turning their findings over to law enforcement for any pending situations. Gull Lake volleyball coach and Events Coordinator Karyn Furlong is serving as the interim AD until a decision is made on the position during the summer. ...The Future's so bright, I've gotta wear shades. Thanks in part to supermodel Kate Upton, Niles high school will be making some changes to the 1950's era football stadium to make watching the game a tad more easy. The lights at Viking Field in Niles are getting replaced. The original light fixtures put in during the 1950's are getting replaced, with the stadium losing four of the eight poles for the exisiting lights. Most importantly,the two light poles at the 40 yard lines on each side are being removed, leaving the field of view unobstructed from the stands. Kate Upton is the daughter of Niles athletic director Jeff Upton. She asked her father how she could help the athletic department, Upton along with Coca-Cola, and a grant from the Fredrick S. Upton Foundation provided the nearly $50,000 needed for the upgrades. The new lighting system will save on electricity, they will also be considerably brighter than the current incandescent bulbs. The light's will be delivered and installed will begin on Wednesday, August 13. St. Joseph will be able to see the new lights in action on October 10th when the Bears varsity visits Niles. Times have been tough for the Benton Harbor school district for several years now. Declining enrollment, resulting in loss of state funding has added up to the Benton Harbor school district operating in a deficit since the end of the 2007 school year. The deficit has grown to $15 Million at the end of the 2013-14 school year. Recently a state appointed financial review team looked into the financial situation and determined that the district is in financial distress. The team has sent their findings to Michigan governor Rick Snyder, who is expected to announce that the school district is in a financial emergency, which would prompt state intervention. The district would have four options to try to get out of the deficit. Emergency Manager, Consent Agreement, Bankruptcy, or Neutral Evaluation Process. The school has stated that they will enter into the consent agreement. That's all for the Tigers news off the field but there is a last minute and unfortate change for the Tigers Head Coaching position. Head Coach Darric Randolph will not be able to continue his turnaround plan for the Tigers. Randolph works outside of the school district and up until now, his schedule at work has allowed him to coach the Tiger football team. Changes in his schedule have put his coaching and job schedule into direct conflict and he can no longer serve as the Tigers head coach. The Tigers will go into the 2014 season with Co-Head Coaches as assistants Mike Gillespie and Randy Jones will direct the Tigers this season. Benton Harbor opens the season at home with Gull Lake. St. Joe will travel the short distance to Filstup Field again this season on October 3rd. The last coaching vacancy in the Southwest Michigan Athletic Conferenc has been filled as Gull Lake has hired Tim VanWormer as their new head coach. VanWormer, 41, spent the last season at his high school Alma Mater Houghton Lake, going 1-8 last season. Previous to that VanWormer spent four years as head coach at Frankenmuth High School, where he went 24-15, going 10-1 in his final season at Frankenmuth in 2012. VanWormer takes over from Tim Hiller who resigned after three seasons, going 8-19. VanWormer's home debut will be against St. Joseph in Week 2. The MHSAA enrollment figures were recently and one SMAC school will be changing their classification, that's our neighbors south on Cleveland Avenue, Lakeshore. Lakeshore's enrollment actually dropped from 892 to 887, even so, the cutoff for Class A is 882 and above. St. Joe is still Class A, increasing from 986 to 1,028. The largest SMAC school is Kalamazoo Loy Norrix, who boast an enrollment of 1,612, 70 students more than rival Kalamazoo Central. The two smallest schools in the league are from Berrien County with Niles at 885 (Class A) and Benton Harbor at 634 (Class B). ...And then there were twelve. The Big 16 is no more. In fact there's no more "Big" anything about this conference anymore. The conference has officially been known as the Southwest Michigan Athletic Conference, but has gone by the unofficial moniker "Big 16". Now with Battle Creek Harper Creek, Coldwater, Marshall and Sturgis leaving for other leagues, the remaining 12 schools are just going by the name "SMAC." Two SMAC schools are undergoing changes at the top of their programs this offseason, most notably just to the south of us as Denny Dock announced his retirement at Lakeshore, our former assistant Bryan Keim has been given the nod as the Lancers new head coach. The other coaching change has not been resolved yet. Gull Lake head coach and former WMU quarterback Tim Hiller stepped down in his role with the Blue Devils. Gull Lake has not named a new head coach yet. St. Joe will be the second game for the new Blue Devils coach and first home game. St. Joe makes a return visit to Gull Lake for the first time since 2006.